It's been a busy season of life for me but even in the thick of things I've managed to keep the creativity flowing. 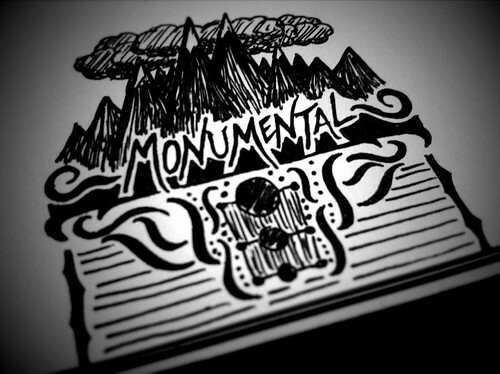 One of my favorite outlets for my creative brainstorms is doodling. Often my little pen and ink sketches are purely abstract, with really no meaning. I merely start drawing and see where the pen takes me. Other times I have a specific idea in mind before I begin. But the point is always to keep it simple and small. I really like to draw small, for some reason. Anyways, I've been kicking out quite a few of these recently and gained a little attention by posting them up on the new design social site, Dribbble.com. The Phoenix New Times culture blog even featured one of my doodles yesterday! You can check out some of my other doodles on my flickr account, if you're so inclined. I love doodling and I hope everyone stretches their creativity every now and again with some pen(cil) and paper. Don't worry about what comes out – these aren't going up in an art gallery! Just have fun, play around with shapes and patterns, and express yourself. Be sure to let me know how your doodling goes. Leave a link in the comment section below – I'd love to see what you create!